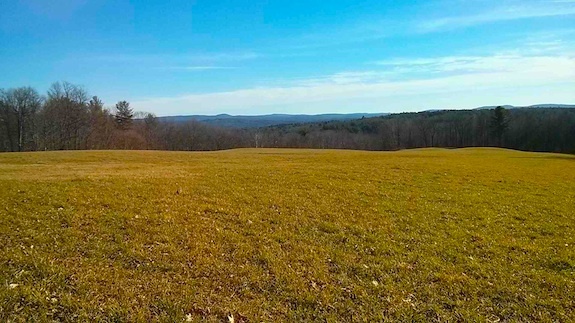 If you had asked me two months ago if I’d be out in a snowless field in central New Hampshire kneeling on dry grass with just a partially zipped hoodie on the day after Christmas, I’d have thought you had taken a strong hallucinogenic drug. By this time of year, the grass is almost always under a blanket of snow, not to be seen again until those luxurious warm days of mid-March when the sun has already climbed halfway up into the sky. But yesterday I was out once again with Jim Cluett, W1PID, and my gorgeous German Shepherd dog Lady. One of the strongest El Niño weather events in living memory has aimed a fire hose of warm air at us. After the past two brutal winters of day-after-day-after-day of snow and bitter cold, I’m not complaining. I needed a break. When Jim asked where I wanted to go earlier on the phone, I told him someplace I’d not been before. 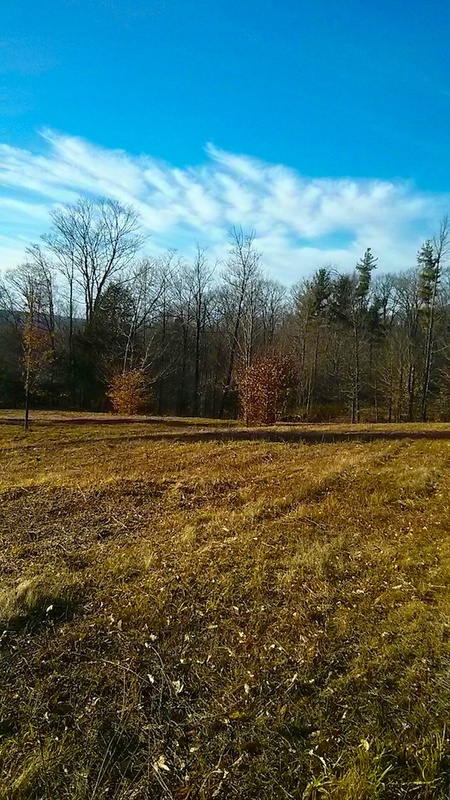 He was kind enough to share one of his very special places, the open fields just north of Hunkins Pond in Sanbornton, NH. Over the past few days we had quite a bit of rain and the Class VI road that leads up to the fields was choked with large puddles of water. Jim tried to use his favorite walking stick harvested by his daughter from a beaver dam to drain one, but I told him he needed a Case backhoe. He gave up after a minute. Lady’s a perfect hiking partner. She doesn’t run off because she knows she’s away from home and doesn’t want to get lost. Some dogs will chase anything and disappear. When you stop for any reason, she often wants to turn around and head back to the car. On this day, she was doing a good job of getting tangled in the diving string Jim and I use as halyards to get our antennas into the branches of the trees that line the open fields. 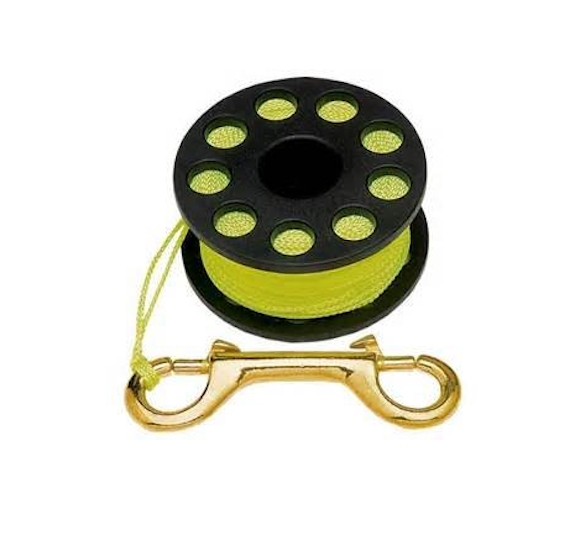 Today was the day I would use my new yellow braided nylon line that comes on the most ideal finger spool I’ve ever seen. Jim has had one for two years and he knew it would make the perfect Christmas present for me. I wasted no time getting my antenna up. Neither did Jim as he set up about 200 feet east of me on the edge of the 5-acre field. I decided to put up my resonant 20-meter dipole antenna and was able to get it to hang vertically with no problem. I connected my MFJ 20-meter Cub radio that’s housed in a water-resistant box. It’s equipped with a digital frequency readout and a delightful electronic touch keyer. Lady was relaxing next to me. I heard lots of stations, but no one could hear my 1 watt or so signal. Not wanting to get skunked, I got out my trusty HB-1B quad-band radio. By this time Jim had already completed three QSOs and was hovering over me wondering if I’d ever make a contact. He didn’t say this, but I felt it. He’s so very polite and patient. As I tuned the HB-1B, I immediately heard a very strong station and copied his call sign the first time, YV5DTJ. 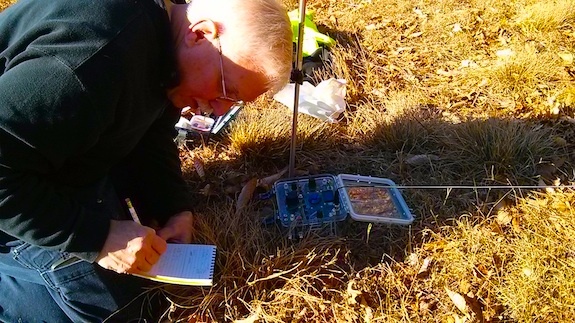 Oh, that would be a nice treat the day after Christmas – a nice outdoor DX log entry! He was in a QSO with K8EHE. I was waiting for them to finish so I could pounce. I gave up and went hunting. Within seconds I snared W4AFB, Keith down in Oviedo, FL. I thought he was ten feet away his signal was so strong. He gave me a 559 which I was very pleased with. We exchanged SKCC numbers, his being 7169S. At one point in the QSO he said, “LOTS OF QRN” so I was quite happy he pulled me out of the ether allowing me to avoid the skunk. By this time it was time to pack up and head back. We walked east along an ancient range road that goes back hundreds of years. 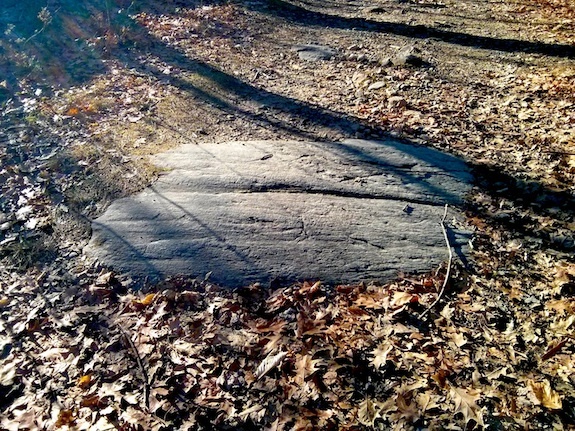 Within minutes I spied a piece of exposed granite bedrock in the middle of the road sporting a large glacial striation or scratch. Just 12,000 years ago the spot where I was standing was covered under two or three-thousand feet of solid ice that stretched back up to the North Pole. You can read all about this in a recent letter to the editor I wrote if you’ve got an interest in geology. Jim, Lady and I walked across another field, down through some woods and across three time-worn stones walls to get back to the car. It was a fulfilling day and quite possibly the last outing of 2015 as a major winter snowstorm was forecast to hit us in 72 hours. Prior to that rain would be pounding the dry grass and leaves that carpeted the quiet fields above Hunkins Pond. Do yourself a favor and stroll through them as we did. You’ll not regret it, especially if it’s a brilliant autumn day. There are only a few days left in the year 2015. It’s already in the record books here in the Northeast USA as one of the warmest autumns and early winters in living memory. An historic El Nino’ weather pattern is blessing us with very warm weather allowing us to get out to do radio. In years past, there could already be 18 inches of snow on the ground and frigid daytime temperatures in the teens. That was not an issue as I could easily get home by 3 p.m.
Mid-morning it was still dismal as a heavy fog was shrouding everything around my home next to Lake Winnisquam. The lake produces a mircro-environment so maybe it was sunny up on the hills and over by Profile Falls just south of Bristol, NH where Jim and I decided to operate. No such luck. It was foggy and damp as we drove down the gravel road to the picnic shelter next to the Smith River that tumbles across the famous falls about a half-mile before the Smith joins the placid Pemigewasset River. Days before, I received a new heater that I thought could help us keep our hands warm while we do CW. I decided to bring it, even though the forecast suggested it would be a waste of time. It’s the Little Buddy propane heater and it quickly became apparent it’s aptly named as he was our buddy that saved the day! It’s a catalytic heater that can be used indoors or outdoors. 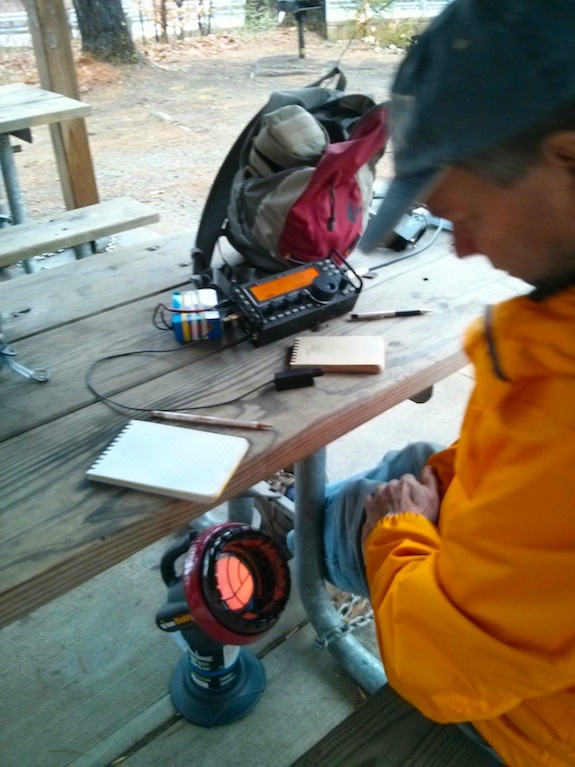 The thermometer failed to get the WX memo and the temperature never climbed above 47 F.
Jim had another perfect throw of his water bottle to get his halyard with it’s 27-foot wire already attached to it up into a branch just above the picnic shelter. The Smith River was engorged with water from the recent two days of rain and was roaring. We decided to just use one radio and I was very fortunate Jim allowed me to use his Elecraft KX3 and micro Palm paddles. 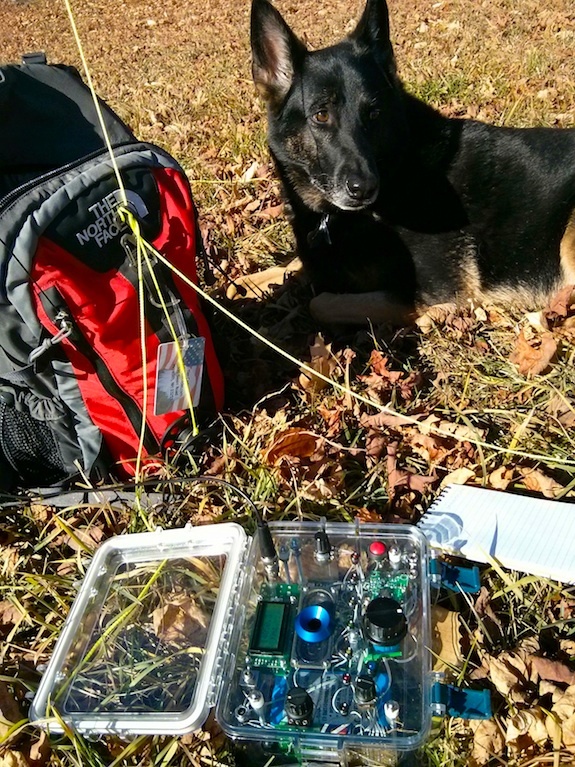 It’s a dream outdoor QRP radio and I plan to have one before the first day of spring 2016. One of the benefits of using the KX3 is you have so many options. It covers all the bands so if one is dead, you go hunting elsewhere. We were not to be denied on this day. Jim jumped on the air first while I adjusted the heater to see what worked best to maximize heat flow. I didn’t tell him I was with Jim, but the combination of working Jim just seconds before and him seeing my QRZ page where I talk about going out with Jim on outdoor adventures was all he needed. That’s the magic of the Internet and what you can skim in seconds if you try. 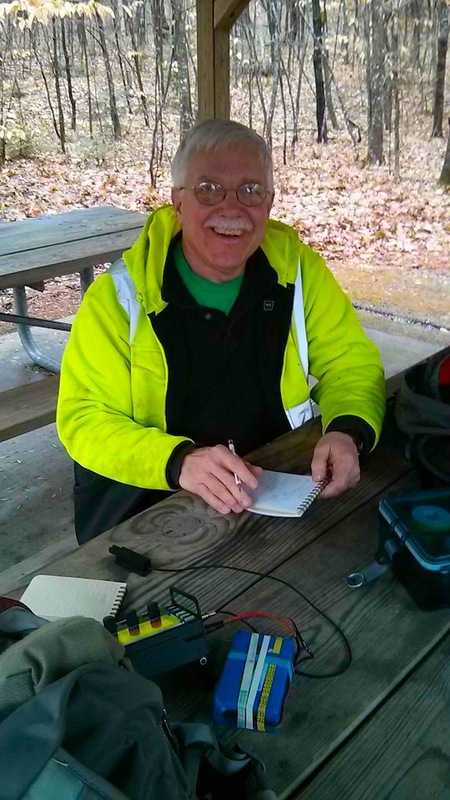 Next up was George, NA9E from ‘Indy’, Indiana on 20 meters. I was weak to him with him only giving me a poor 239 RST. In return, I sent a 559 because he was quite strong to us. I looked up at one point and across the road in the mist were four women dressed in full riding gear, including helmets, riding wild Christmas Eve stallions. 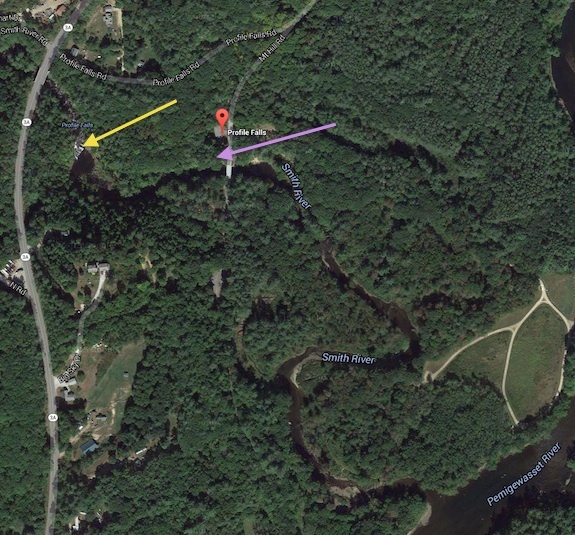 I waved and we exchanged “Merry Christmas” greetings and they headed south down the gravel road towards old Hill Village next to the Pemigewasset River. 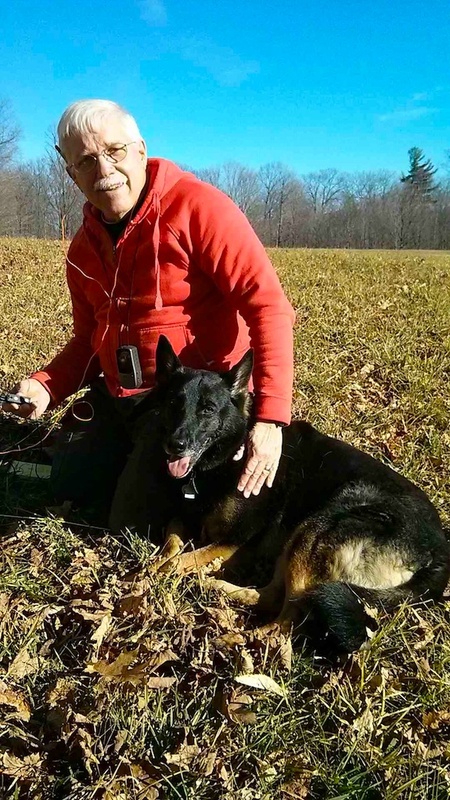 Jim and I finished up working Tom, K9DAC in Ohio. I got a respectable 579. Time was beginning to run short and if we wanted to grab a cup of coffee before church, it was time to pack up. We were blessed to get out and it was wonderful to be in the woods on Christmas Eve. We both wondered if we’d get out again. As it turned out, the weather forecasters missed the forecast by just 24 hours. On Christmas Day, it was a balmy 57 F at my home as I wandered outdoors to look up at my recently raised dipole antenna. 2015 has been a magnificent year for me as I’ve gained more experience and am no longer timid about getting on the air. I looking forward to 2016 and feel it’s the year I’ll transform into a respectable operator. As Kenny Chesney says in his hit song, “Only time will tell, bit it ain’t talkin’“. Listen for yourself and play the following video! Yesterday, December 16, 2015, I received a message within Facebook from a new friend, K1QO – Ann Byers. She had also included Dave Benson, K1SWL in the tiny direct message. When I first saw it, I was not too interested. There were a couple of reasons, the first being my track record in contests is dismal. My CW listening speed, on my best day, is just barely 12 WPM. I did have my first real contest success two months before during the Zombie Shuffle, but my understanding is that it’s just a very low-impact event. When I turn on the radio on the weekends the exchanges I hear are as fast as a peregrine falcon in a full tuck position as he screams down from the sky to grasp his next meal with his sharp talons. Contests are not for the faint of heart is how I felt when I read Ann’s message. The second reason is after 6 p.m. I’m usually brain dead. By 8:30 p.m. on most evenings I’m comatose as I love to get up around 5 or 5:30 a.m. How could I even concentrate on code in that condition? I decided to go to the NAQCC page describing the contest and there it was, the hook. Okay, you got me. I’ve never operated at one watt, much less milliwatts, so this could be interesting to see if anyone can even hear me, much less I hear them! I was in the shack after having a delicious bowl of fresh home-made Italian vegetable soup Kathy made. Moments before, I completed creating a crude spreadsheet on a cheap school notebook. It had six columns to record the data of each QSO. I decided to start out on 40 meters and just before the start time I heard someone calling CQ SW on 7.030. I didn’t write it down, but I’m pretty sure that’s what it was. 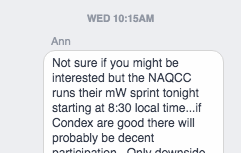 That wasn’t anyone with the NAQCC sprint because the call out was supposed to be CQ NA. The moment the clock on my IC-7000 said 1:30 I started sending CQ on 7.033. I got nowhere fast for about five minutes. No one came back. My initial thought was that my ICOM radio power meter was possibly wrong. I had adjusted the power level to 1 percent which is supposed to equal 1 watt. But maybe I wasn’t transmitting at all. How was I to know? I’m sure there’s a way, but I’m not there yet on my amateur radio journey. I decided to switch to 80 meters and went to 3.561 as a QSO was in progress on 3.560. I sent out my CQ NA two times and BOOM someone came back! It was W2JAZ in NJ. Then it happened. A pileup. I’m talking one of those pileups you see each winter on TV when 20, 50 or 90 cars and trucks plow into each other on the interstate highway in a blinding snow squall. Once I finished up the fast RST, state and power exchange, they descended on me like ticks as you waltz through tall grass in the spring. There were so many competing signals I couldn’t pull any one out. I sent back a question mark. That did no good as the vultures just came in that much faster and more aggressive. I panicked. Not knowing what to do, I turned the dial to stop the cacophony of code. I was very embarrassed because everyone knew who I was and no doubt they were about ready to send “LID”. I took a breather and immediately texted my CW and outdoor radio mentor W1PID. He said to go to 3.563 and we worked each other. We’re only about seven miles apart and his signal was a mere whisper as mine was to him, but we did complete the exchange. I was excited! I was working stations, they were hearing me and I could understand what they were sending. Maybe, just maybe I can do a contest or two! I was unable to copy the power or NAQCC number of two of the operators due to my excitement, the floor noise and my tinnitus. But it doesn’t matter to me because I was stoked about my success! 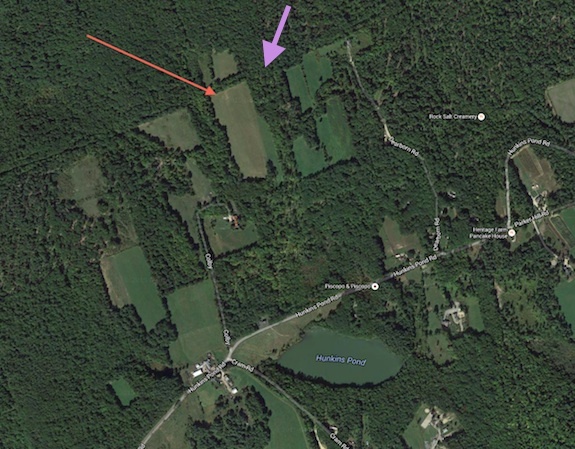 I decided to call Jim Cluett, W1PID to tell him about what had happened. We hung up and I sat and collected my thoughts basking in my success. I pondered for a moment. I wondered if I hadn’t discovered a new trick with respect to contesting. Jim has taught me over the past three years his search and pounce method of operating. 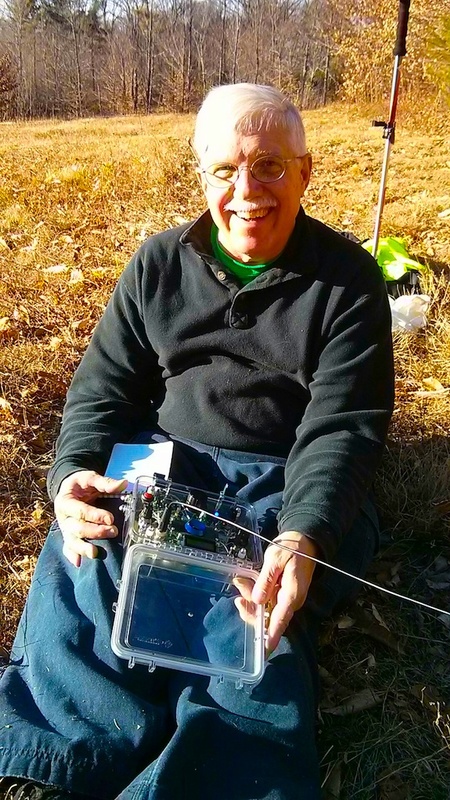 He turns the dial of his KX3 out in the field and if he hears a strong station, he pounces on them getting a QSO. Well, what if everyone is doing what Jim does? If everyone is listening and no one is transmitting, then I guess you wouldn’t hear anything. Jim told me I was holding court on 3.561 and that’s not a bad thing to do when contesting. Now I just have to figure out what to do when they come. It’s sort of like the classic movie Field of Dreams. We shall see as I now am much braver and feel I can compete in a contest. Thanks Ann for telling me about this contest and maybe next time you’ll be in my log! 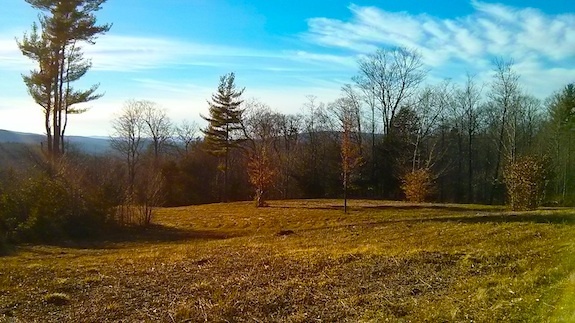 Yesterday was a stunning early December day in central New Hampshire. The sky was blue and the temperature soared over 50 F. With no wind it felt like spring, not late fall with winter on the doorstep. 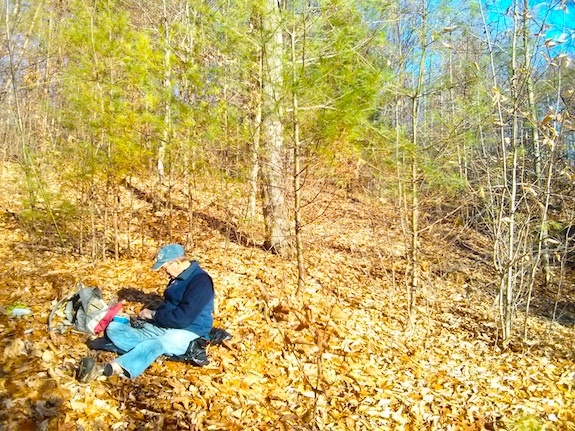 Jim, W1PID, and I went to hike and do radio on a 90-acre parcel of land I own. We headed up a small path used by neighbors who ride ATVs. 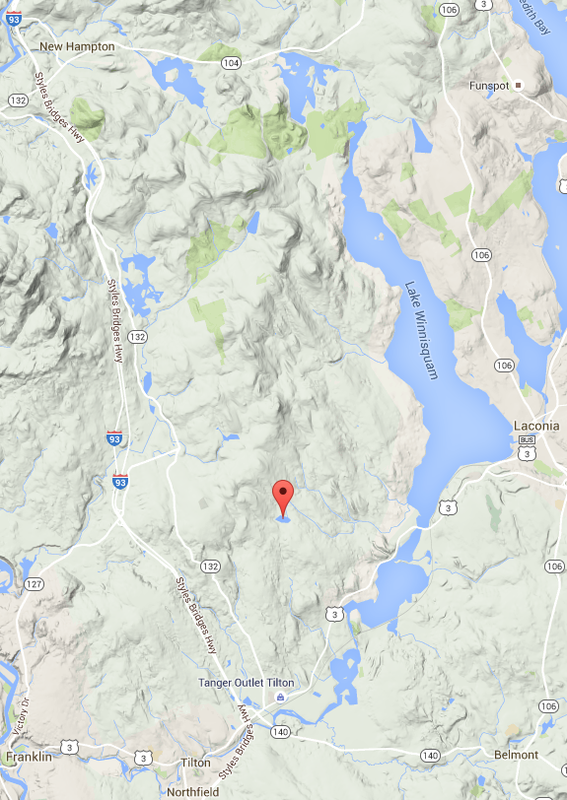 The first 200 feet were a steep climb up across some bare granite bedrock ledge. It didn’t take long for us to locate a nice spot in the forest to set up. There was no real clearing so throwing the halyard up into the tree to a particular branch was a challenge. After two, maybe three, attempts I convinced Jim that his antenna would be only 15.7 degrees off vertical. 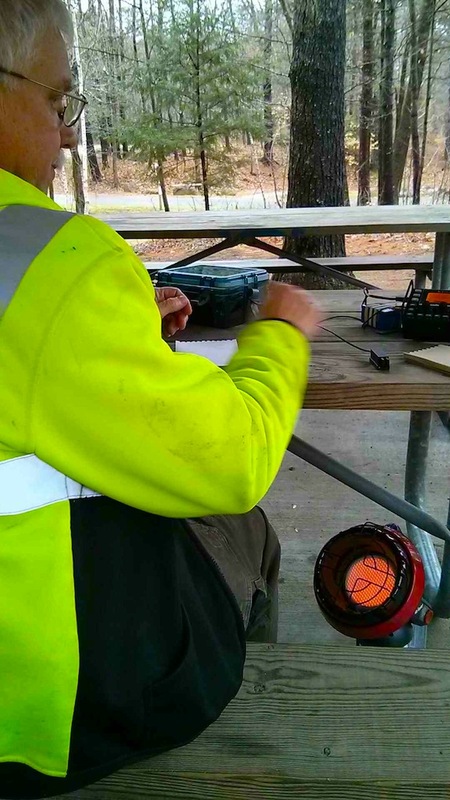 He succumbed to the frustration and sat down to operate his fine KX3. As usual, it doesn’t take long for him to snag someone. He found Bob in the Bahamas. Bob was sending CW faster than I could hear, but I did make out some words while he and Jim were chatting. I heard “woods”. I continued to listen and told Jim I had his call sign. It took me five times with me just getting one character per pass. But by gosh I got it with no help from Jim. Jim handed me the micro Pico Paddles and I got to work Bob next. This was the first time I’d ever use an Elecraft KX3! Jim was at the controls, I just had the key. I threw out my call sign and Bob heard it. He came back right away with “W3ATB 599”. I sent back “R R 599” and hesitated. I didn’t know what else to do! There was a pregnant pause of dead air and Bob went on to work someone else. Jim was teaching me yet another thing about radio magic. We packed up and hiked a little deeper into the woods before heading back to a large open field. By the time we got back to the field, it was even warmer. So warm I took off my hooded sweatshirt. I was basking in the gift God gave us on this warm December day. Jim set up in no time and I was about 100 feet away getting up my resonant 20-meter dipole antenna. My first throw with my halyard was perfect. It was an easy throw with no obstacles. The key thing is to lay out the micro-cord on the ground so it doesn’t snag on a branch or any other piece of vegetation. Within a few minutes I had my RG-174 coax cable connected to my MFJ 20-meter Cub that puts out maybe 1.5 watts on its best day. I heard stations and told Jim I wasn’t leaving until I avoided getting skunked. Within minutes I had my first QSO. I’m getting better, there’s no doubt about it and the little Cub’s power was fine and dandy. Who said you need 25, 50 or 100 watts? My first QSO was with Rob, K3COD. He gave me a 569 which I was thrilled with. Way to go little Cub! You were doing good down into Apex, NC! Next up was Jorge, KP4GC in Puerto Rico! I also got a 569 from him. I was tuning around and there was AF4K finishing up with someone in France. Jim wandered over and was listening over my shoulder. After AF4K sent his “di dit”, I threw out my call. My Cub’s touch keyer speed was set up to about 18 WPM, much faster than I could hear. I made a critical mistake and forgot to bring the manual with me that shows how to reprogram the keyer speed. OUCH! Believe it or not, I did copy Bry as his name! But I didn’t hear him say, “DN 1”. “You need to go down one!” Jim was referring to one KhZ. What I didn’t know is that Bry was working Bert in France – Jim had heard that – and Bert owned that frequency. If I all of a sudden started talking to Bry, then Bert would be none too happy! We adjusted the dial and finished the QSO. Bry gave me a solid 579. After that it was time to pack up and get home. I was running late as I told Kathy, my wife, that I’d not be out too long today. But Mother Nature tugged way too hard and it was impossible to leave the majestic 90 acres I’ve worked so hard to acquire. Kathy understood, after about three hours, once I got home. 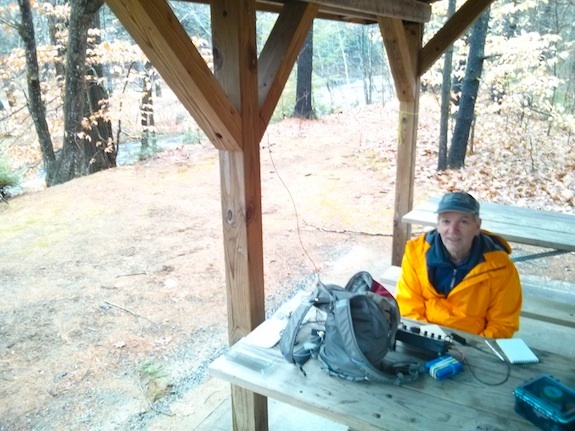 It was another amazing day of outdoor radio in the woods of central New Hampshire!